The Bay-headed Tanager, Tangara gyrola, is a medium-sized passerine bird. This tanager is a resident breeder in Costa Rica, Panama, South America south to Ecuador, Bolivia and southern Brazil, and on Trinidad. It occurs in forests, particularly in wetter areas. The bulky cup nest is built in a tree and the normal clutch is two brown-blotched white eggs. The female incubates the eggs for 13–14 days to hatching, with another 15–16 days before the chicks fledge. . 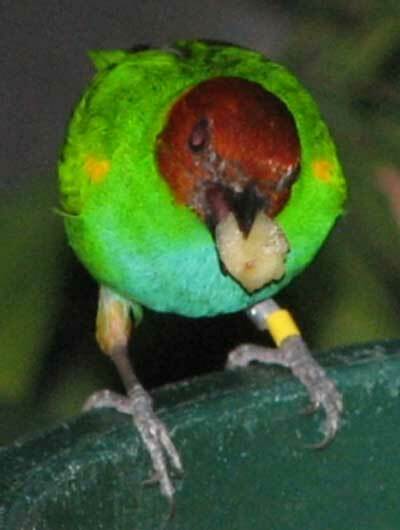 Adult Bay-headed Tanagers are 14 cm long and weigh 19.5 g. The nominate race T. g. gyrola is mainly green apart from a chestnut head, a blue belly, and a thin gold collar on the hind neck. Sexes are similar, but immatures are duller with chestnut-flecked green heads. There is considerable plumage variation between the various subspecies, and T. g.viridissima of northeast Venezuela and.Trinidad has green underparts concolorous with the rest of the body plumage. These are social birds which eat mainly fruit, usually swallowed whole. Insects are also taken, mainly from the underside of branches. The Bay-headed Tanager’s song is a slow seee, seee, seee, tsou, tsooy.